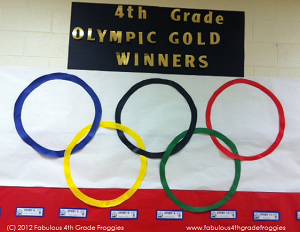 Teach Laugh Plan: 4th Grade Review - Olympic Style! Testing is now over but I jut had to share how my fourth grade team reviewed for an entire week and the kid loved it! Yup, you heard me right! The kids LOVED reviewing for our state test! 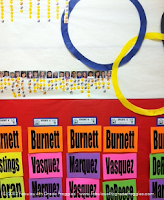 The week before testing our grade level decided to have a competition of Olympic proportion! The picture above is part of the hallway display we put up between some of our classrooms. We kind of thought of this at the last minute and could have made it so much better but there's always next year. 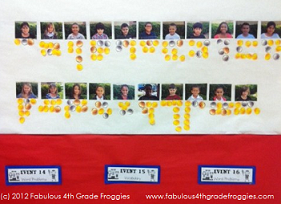 Each day the students had to "compete" in 4 events - two reading, two math. The blue bordered titles on the red paper above tell the events.... Event #1 was Main Idea, Event #2 was Geometry, etc. The teachers did a reteach of whatever the skill was in their own classrooms, then we all gave the same 10 question assessment. Each student had the opportunity to win their own medal and then the classroom as a whole could win bragging rights. Each teacher recorded their students scores in an excel sheet and the class that had the highest average overall won gold, second won silver, and third won bronze. You can't really see it in this picture but we had Gold Silver Bronze medals going down on the red paper. The names are the names of the teachers. I was determined to take down Burnett so happy for Mrs. Burnett since she took the gold 6 or 7 times in a row! On the white part of the display we attached a picture of every 4th grader in our school by clustered by classrooms. We have six 4th grade classrooms with 22-24 students. The students earned individual medals too. Gold = score of 90-100, Silver = 80 -89, and Bronze = 70- 79. 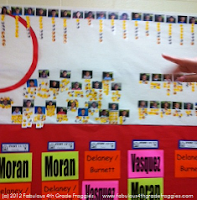 When the teachers graded the assessment (sometimes we did it as a class as we went over it) the students got their score and gave the student whatever medal they earned so they can place it under their picture. OMG! You would think the medals were real (they were printed on cardstock) with all the excitement the students had. It was amazing how hard the kids tried to get medals. Next year we would like to have a "closing ceremony" with some sort of celebration. We will start planning way earlier and may even do it every Friday for a month instead on 4 days in a row. Either way, the kids were really engaged and loved our 4th Grade Olympics! How did you review for your state tests? Awww thanks Stephanie! Hopefully we will be smiling when we get the test results as much as we were smiling during the review. Lorraine!!!! That is awesome! It takes working with a dedicated, hard-working team to pull that off. How fun is that! Congratulations on another awesome review! This looks like so much fun and a great mix of review and rewarding achievement! I am recommending this to my teachers for next year. I really like this idea. I am going to add this to the "test prep file" for next year. We take our tests this week, I feel like my darlings are as ready as we can be. May they have the stamina and focus to pull it out!! !